Back in November, I signed up for The Great Food Blogger Cookie Swap of 2011, hosted by Lindsay and Julie. Sounded like a fun idea and I thought I would have tons of free time now that our wedding was over. Well, I was half right. Food Blogger Cookie Swap was indeed fun. I, however, managed to maintain a really busy schedule despite the lack of wedding planning to-dos. 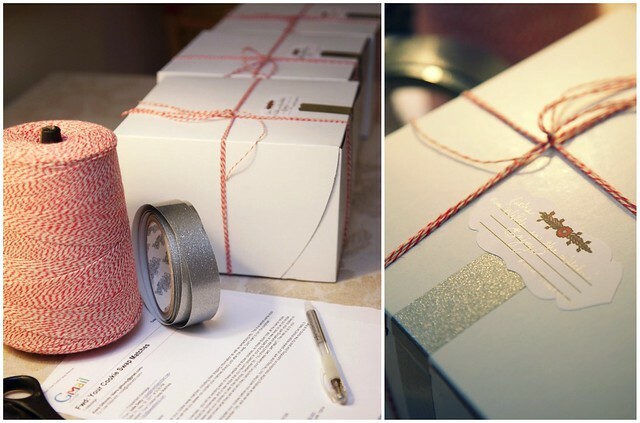 We all get busy around the Holidays, but that doesn't mean we can't send out pretty cookie care packages to a few people. I tried to make something that was pretty and festive, but also and easy and quick enough for almost anyone to do. 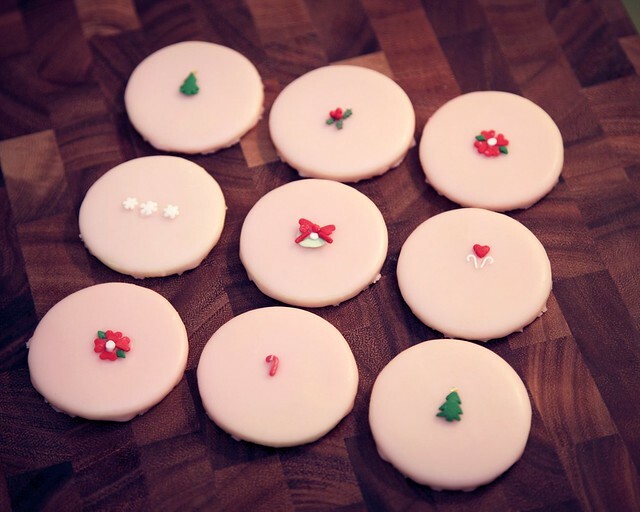 While decorated sugar cookies are nothing that new to me, this particular icing was a complete experiment with the sugar cookies. It occurred to me that poured fondant was an interesting and easier alternative to the usual royal icing. The peppermint and chocolate flavor combo is very much a holiday favorite of mine so I knew I had to incorporate it. I went for a very simple, understated use of sprinkles. I tried to get creative with them and see what I could make out all the little shapes I have. For example, I gave my best attempt at a poinsettia with red hearts and mini christmas tree sprinkles. 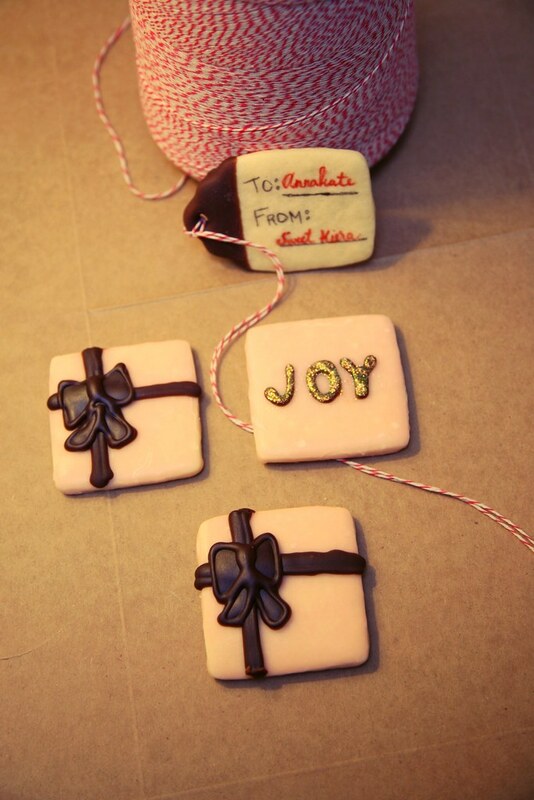 Using the quick poured chocolate fondant, I piped on a quickie chocolate ribbons and bows and wrote JOY on some of the cookies. I even added some edible gold glitter to the JOY cookies for some extra holiday cheer. I packaged up my little cookies and happily shipped them off to Vicki of Wilde in the Kitchen, Annakate of La Aguacate, and Kara of Kara is Mochi Bunny. Lemon Ricotta Cookies with Lemon Glaze from Kate of Food Lust. Meanwhile, in a separate mixing bowl, whisk together flour, baking powder, and salt. Add eggs to creamed butter, one at a time, scraping down bowl and mixing well after each addition. Add vanilla extract to and mix on low speed until well combined. Add flour mixture to butter mixture, one cup at a time, while mixing on low speed until dough comes together in one big mass. Place sugar in saucepan. Combine water and corn syrup; add to sugar and stir until well-mixed. Cook over low heat. Don’t allow temperature of mixture to exceed 100°F. Remove from heat; pour out 3/4 of the icing into a bowl, stir in peppermint extract and a teeny tiny drop of red food coloring, and set aside. With the remaining icing in the pan, stir in melted chocolate. If mixture is too thick, you can add up to 2 tablespoons of water. Pour peppermint icing over cookie or spread on with spatula. 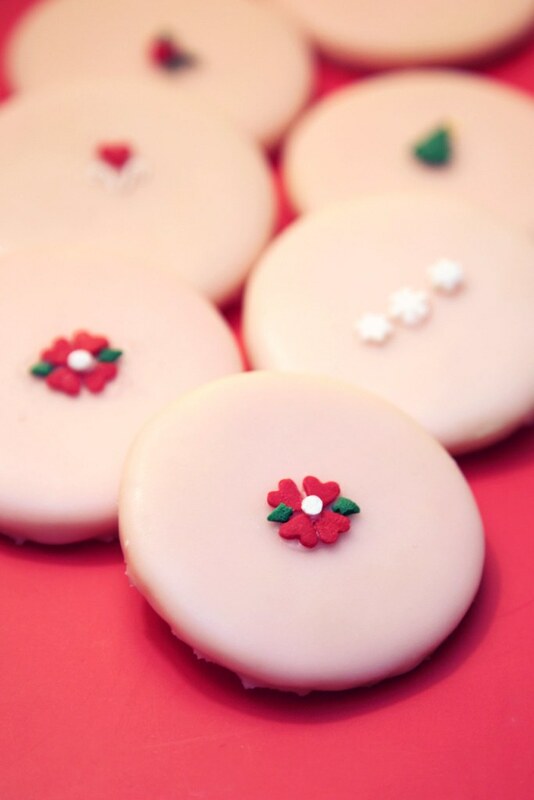 Add little holiday sprinkles for decoration. Use a bit of the poured fondant as "glue". Let set. Put the chocolate fondant in a piping bag or ziplock bag with a tiny bit of one corner snipped off with a scissor to decorate peppermint fondant coated cookies.